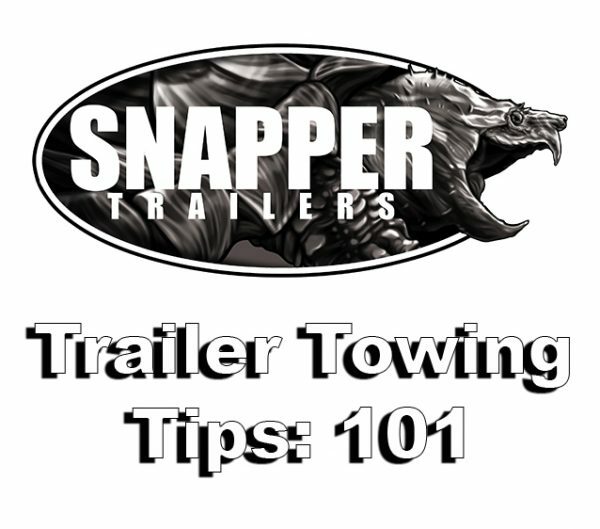 They didn’t exactly cover proper trailer driving tips in high-school drivers education, so here’s a few tips and techniques from the Snapper Trailers team to ensure you know the rules and precautions of the road. Always reduce your normal driving speed when towing. Do not exceed 55 Miles per hour. Leave extra time and distance between you and other vehicles when towing so you can stop safely. As a rule of thumb, leave about 4-5 seconds between you and the vehicle in front of you. Be alert and wear your seatbelt at all times. If swaying or whipping occurs, take your foot off the gas pedal. Do not brake or speed up. Use the same gear to go downhill as you would go uphill as a rule of thumb. This will help you control your speed downhill. Slow down before going downhill. When turning a corner, pull out into the road a little bit before turning and turn wider so the trailer will not hop the curb. When parking, try to park in a place where you can pull forward so you don’t have to back into or out of a parking space. When backing up, try placing your hand on the bottom of the steering wheel and looking over your shoulder move your hand to the right to make the trailer go right, and to the left to make it go left. If you are backing up, and you start to jackknife, just pull forward to straighten the trailer out and try again.